The recently-concluded COP21 has, once again, reignited the debate over climate change negotiations. For the first time in twenty years of UN negotiations, the aim was to achieve a universal agreement on climate change. The main objective of the Paris climate change conference was to achieve – firstly, legally binding provisions aiming to keep global warming below 2°C target and secondly, extracting commitments for financial contributions to the Green Climate Fund that each country is likely to make. “Climate atmospheric stabilisation” and “climate finance” have emerged as two crucial components of COP21. The stakes are high for the “emerging economies” as these countries require large amount of energy to generate and maintain growth and economic development. The international political response to climate change began with the Rio convention at the Rio Earth Summit 1992 that adopted the United Nations’ Framework Convention on Climate Change (UNFCCC). 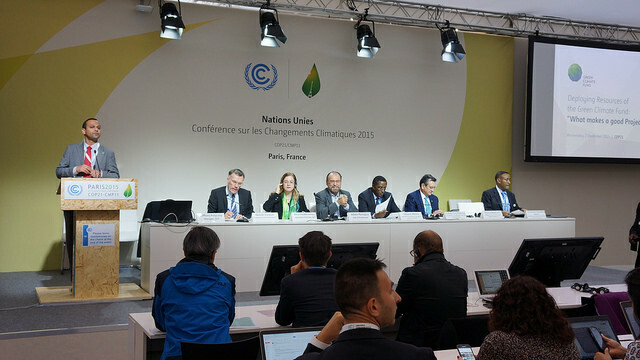 The Convention sets its general goal, namely “stabilisation of greenhouse gas concentrations in the atmosphere at a level that would prevent dangerous anthropogenic interference with the climate system.” It further states this level should be achieved within a time-frame sufficient to allow ecosystems to adapt naturally to climate change, to ensure that food production is not threatened, and to enable economic development to proceed in a sustainable manner. Climate atmospheric stabilisation targets the reduction of greenhouse gas emissions (GHG) with limiting global temperature to 20 C to pre-industrial level. At current rate, the average global temperature could rise by two to three degrees within the next 50 years or so, with several degrees more if the same emissions continue. At the Paris Deal 2015, pledges were made to limit the GHG emissions below 20 C and a more ambitious goal of 1.50 C was set. This is a tall order that requires developed countries to massively reduce their emissions and provide huge financial support to developing countries. Top 10 emitters contribute 72 per cent of global greenhouse gases (GHGs). On the other hand, the lowest 100 emitters contribute less than 3 per cent. While universal climate action is necessary, significant mitigation actions are needed by the largest emitters, taking into account that they have different capacities to do so. Highly industrialised countries with large GHG emissions would have to contribute most to problem solving as they are likely to suffer least from climatic changes because they have a high capacity for adaptation. Developing countries, in contrast, are much more likely to suffer from climatic changes because of their smaller capacity for adaptation. Even if they reduce their economic growth to zero, they could not contribute significantly to solving the problem (with the exception of emerging economies such as China, India and Brazil). However, the large emerging economies whose commitment to GHG reductions is essential, have a different take on the issue. India has said that it has no problem in freezing carbon emissions at current levels to avoid any further rise in global temperature over 0.80 C but that will impede growth. Developed countries have already occupied two-thirds of the three gigatonne carbon emission space available to stop a rise in temperature above 20C. India is the third largest emitter with 5 per cent contribution to global emissions and one-seventh of the coal consumption compared to top two emitters – China with 27 per cent and the US with 17 per cent contribution to global emissions. The demand is to vacate the carbon space to create room for others to develop and achieve emission reduction in accordance with the rate of time preference than that required by the rich, industrialised economies. This assumption is based on the notion of “survival emissions” required for development in the developing economies rather than “luxury emissions” for the developed countries. Reduction in carbon emissions requires application of technologically advanced, alternative methods of emission reduction in the form of clean energy and ensuring sustainable way of life to develop a low carbon economy. Currently, GHG emissions are primarily a function of economic output. Development is the resultant factor that is locked in fossil fuels that are cheap, compared to alternative forms of energy. The goal is of course to delete emission trajectories from economic growth. This means that almost automatically, for the time being, all are engaged to emit GHG inspite of their position on the development ladder. The large economies are large GHG emitters. And, with the exceptions of China, India, Brazil, and emerging economies, these large economies are also the richest and technologically most advanced countries capable financially to deal with climate change. It is estimated that to limit emissions to 20C, an investment of US $16.5 trillion in low carbon technologies is required over the next 15 years (International Energy Agency: Special Report on Energy and Climate Change 2015). The bulk of these investments target the climate change vulnerabilities of countries. While for countries in East Asia and the Pacific region, the number stands at 46 per cent of total adaptation finance (US $12 billion), for sub-Saharan Africa the number is 13 percent (US $3.3 billion) and for Latin America and Caribbean, the investment is 12 per cent (US $3 billion) of total adaptation finance respectively .The majority of finance flows remained within the country of origin. In 2014, about 74 per cent of total climate finance flows and up to 92 per cent of private investments were raised and spent within the same country as suggests the same report. A Climate Policy Initiative Report (Nov 2015) titled “Global Landscape of Climate Finance 2015”, states that global climate finance flows reached at least US $391 billion in 2014 due to increase in public finance and private investment in renewable energy technologies. The Green Climate Fund (GCF) raised within the framework of the UNFCCC acts a mechanism to assist developing countries to adapt and counter climate change. It is intended to raise climate finance of US $100 billion a year by 2020. The present initial capitalisation of GCF amounts to only US $9.3 billion (including nearly US $1 billion from France). The member countries have taken the Intended Nationally Determined Contributions (INDCs) pledges in the post 2020 scenario to create capabilities and adopt low carbon economies and to build climate resilience. With no legally binding principles emerging from COP21, it has made the agenda of contribution to climate finance very weak. COP 21 has emerged more in favour of the developed economies than in favour of the developing economies. The climate policy analysts are of the view that the Paris Deal 2015 is a major political loss for the developing countries, including the emerging economies because it disregards the responsibility of historical emissions, at the same time occupying a larger share of the carbon space. According to World Resources Institute, the already existing historical emissions (1850-2011) baggage for the world to carry comes from the contribution of US (27 per cent), the European Union (28 per cent), China (11 per cent), Russia (8 per cent), Japan (4 per cent), India (3 per cent), Canada (2 per cent), Mexico (1 per cent). Denying the historical baggage means disregarding the principle of equity and justice in owning and sharing the liabilities towards the future generations.